I'm back with my second guest design post for Newton's Nook! 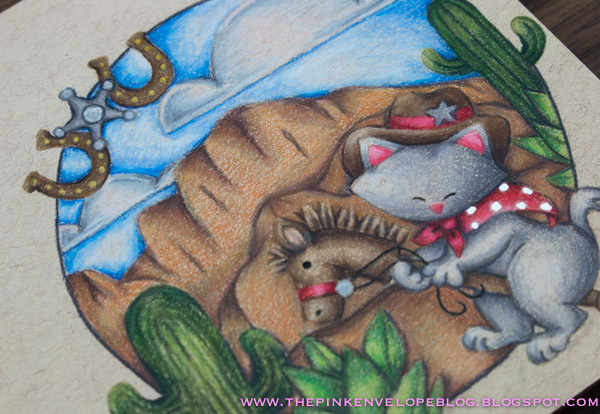 Today I'm showcasing two stamp sets that were released last month. Ah-dorable. For this card, I thought I'd really switch gears and go with some no-line coloring on kraft with Prismacolor Color Pencils. Newton on that horse just tickles my funny bone peeps. The name of this stamp set is Newton Rides West so I thought why not make this guy look like he's riding west on his little hobby horse? The first thing I did was trim down some Strathmore Toned Tan Paper to 5"x5". Then I lightly traced a circle with a pencil in the bottom right hand corner. Use anything you like folks. A die, a bowl, a glass. Whatever's handy to get your circle. It just needs to be big enough o fit your scene. 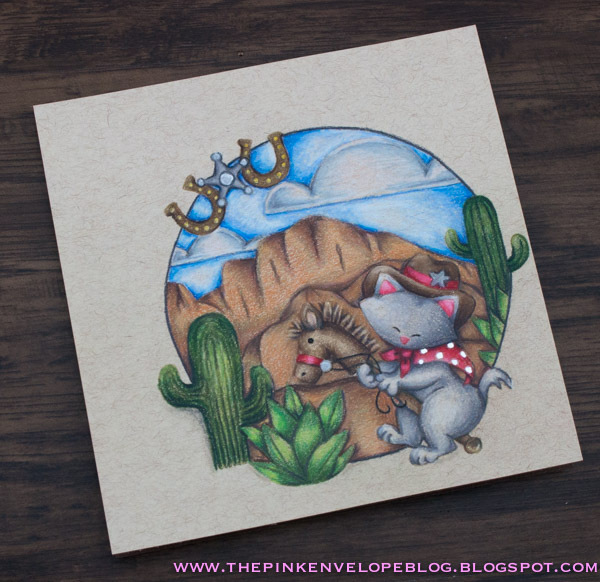 After I had my circle traced, I stamped all of my images with a Kraft Colored Ink. The two Cacti in the front are from the Cultivated Cacti Stamp Set that was also released last month, These are solid image stamps ladies and gents. However, since I was stamping in a light ink and my plan was to no-line color this was no big. There was very little masking for this card. I let some of my images go outside my circle and only needed to mask of what I wanted to keep inside my circle as well as any images that would overlap. Pretty. Easy. While I pondered what I wanted my background scene to look like, I colored all of my stamped images first with Prismacolor Colored Pencils. I thought red would make great accents with all of the green and brown I had going on. Boy does that red really pop! Now for my background. I'm really not a great freehand artist folks. Most of the time I can look at an image and recreate it though. It's not fancy or perfect, but it gets the job done. So, I Googled "desert scenes" and between a combination of a few different images, I sketched out the mountain(? ), cliffs(?) behind my foreground images. I went with some orange undertones for this so it would set apart from all of the brown in Newton's Hat and the Horse. For the sky, I made stencils using some acetate and the Newton's Nook Design Sky Border Die Set. Then using the stencils, I lightly traced a portion of each on to the panel. I really wanted the sky and the clouds to pop so I went with bolder blues and took advantage of the White Prismacolor Pencil on the clouds. To finish it all off, I went over the polka dots in Newton's scarf with a Signo Uni-Ball White Gel Pen. I also added some Signo Uni-Ball Silver and Gold accents to the two Stars and the Horseshoes. 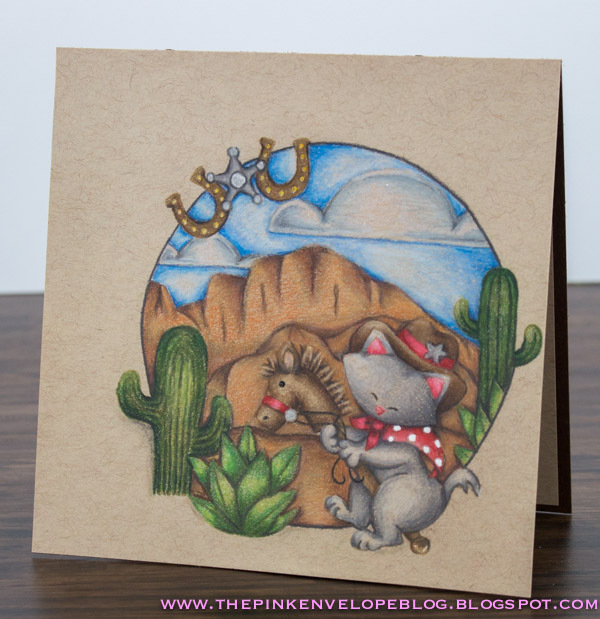 A lil bit of Clear Wink of Stella to the Cacti and a dark brown card base and we have ourselves a finish card folks! That's it! I really hope you enjoyed my card today. Thanks so much for stopping by to see me! This is fantastic! I'm inspired to break out my pencils! Awesome work, those coloring are amazing! A really gorgeous scene. No-line coloring always impresses me! !